Special Price Save $15.00 from normal Selling price! Essential Oils are rapidly becoming recognized for thier great powers to heal and care for the body, mind, and spirit. These God given gifts of nature, are provided for us for a wide variety of minor complaints and symptoms. If your child scrapes his knee, the use of these oils can prevent infection. Now you can discover the benefits of using Essential Oils. 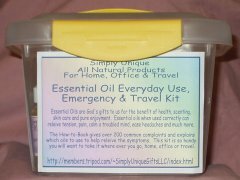 The How-to-Book provides information on what essential oils are, how to use them and over 200 common, minor complaints and explains which oils work best for each one. Orders outside of the USA must pay a higher postage. Items will cost between $9.00 and $18.00 for International Postage. Please notice, this is not a handling fee, this is actual shipping costs. 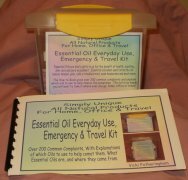 Compare our kit to others that only give you 1/32 if an ounce to 1/8 of an ounce of the oils included. 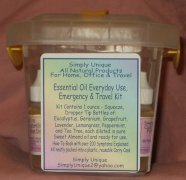 Simply Unique kits have 1/2 ounce of straight, non-diluted essential oils, and 1 full ounce of the diluted, ready to use oils mixed with Sweet Almond oil. Included in kit: 7 Squeeze top - Dropper-Tip Bottles of 7 different Essentials, 1 squeeze, dropper-tip bottle of Pure, Cold Pressed, Sweet Almond Oil, How-To-Book for complete guidance on use of this kit, And a convenient carry case to keep all items neatly packed and ready to just grab and go. E-mail me with any comments questions. Please allow 2-4 weeks for delivery, the a demand for these kits has been overwhelming! We e-mail each customer as we are ready to ship orders out. Orders outside of the USA must pay a higher postage. Items will cost between $9.00 and $18.00 for International Postage. If the link does not work at this time, we do not have the kit ready to sell, so check back in a few weeks. This page created on June 9, 2003 and last updated on October 5, 2003.